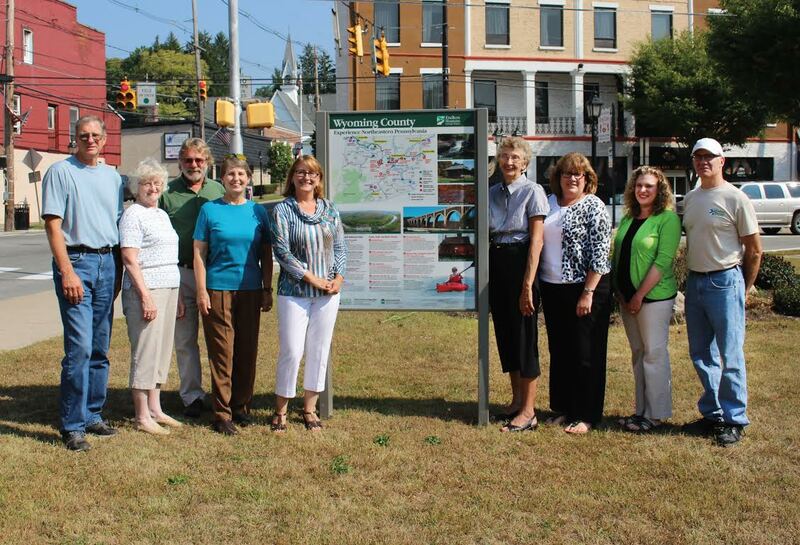 The Endless Mountains Heritage Region was well-represented at the recent unveiling of a sign marking heritage destinations throughout Wyoming County. 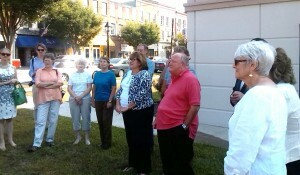 Joining the Wyoming County Commissioners and other civic leaders in Tunkhannock on Sept. 8 were (top, from left) board members Ed Zygmunt and Marion Sweet, greenways coordinator David Buck, board member Sarah Carr and executive director Annette Schultz, Wyoming County Commissioners representative Judy Mead, Endless Mountains Visitors Bureau executive director Jean Ruhf, and board members Erica Rogler and Rick Hiduk. Attendance for the official unveiling of a new sign in Tunkhannock on Sept. 8 that depicts historical and natural destinations in Wyoming County was higher than expected, indicating a strong interest and support in the region for heritage-based projects supported by the Endless Mountains Heritage Region (EMHR) and other like-minded agencies. 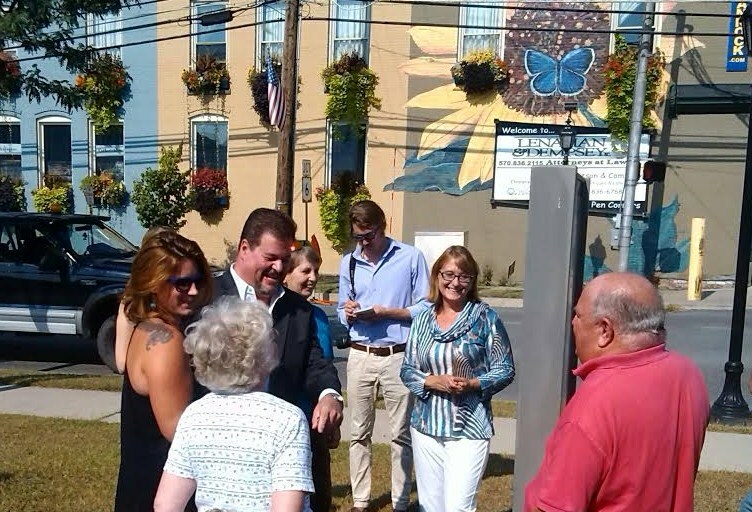 The new panel, which includes a map designed by DDH Design of Tunkhannock, was installed on the back of the existing Tunkhannock River Town sign in the lawn of the Dietrich Theater at the intersection of Routes 6 and 29. 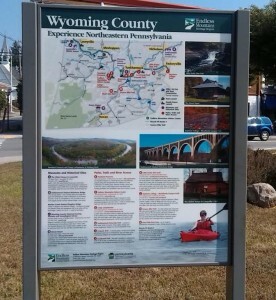 County Commissioner Tom Henry said that the sign is at the “perfect location” for both local residents and visitors to the area to review its contents and choose from more than a dozen museums, historical sites, parks and public lands throughout Wyoming County. River access points are also clearly marked for canoers and kayakers and anglers. Descriptions matching numerical and alphabetical bullet points on the map are provided, as well as addresses, phone numbers and websites, enabling a Smartphone or e-tablet user to quickly access more information and driving directions. The sign was made possible through funds secured by EMHR and the Pennsylvania Department of Conservation and Natural Resources. It is the second of four planned signs EMHR hopes to install. 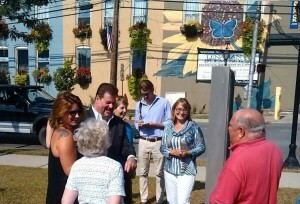 A similar sign and Bradford County map were unveiled last week in Towanda. Of particular note on the Wyoming County map is a cluster of sites on the Vosburg peninsula in Washington Township, where The Howland Preserve, Camp Lackawanna and the Endless Mountains Nature Center bring together nearly 1,000 acres of hiking and biking trails, river access, and education programs for family members of all ages. EMHR has supported past development at Vosburg in lieu of a county park and is slated to host a Water Trails Management meeting there on Friday, Sept. 11. Schultz noted that the signs in both Bradford and Wyoming counties can be easily replicated, and Schultz would like to see others installed throughout the county. They can also be printed as banners for use at public events or indoor displays. EMHR plans to install similar signs with maps in Sullivan and Susquehanna counties as funds become available. In addition to commissioners Tom Henry, Ron Williams, and Judy Mead, who represents the commissioners on the the EMHR board, were Wyoming County Chamber of Commerce director Gina Severcool Suydam, Tunkhannock Business and Professionals Association president Nancy Parlo, Endless Mountains Visitors Bureau director Jean Ruhf, and Dietrich Theater director Erica Rogler. The latter two also serve as EMHR board members and were joined by fellow Wyoming County board members Sarah Carr and Rick Hiduk and Susquehanna County board member Ed Zygmunt. 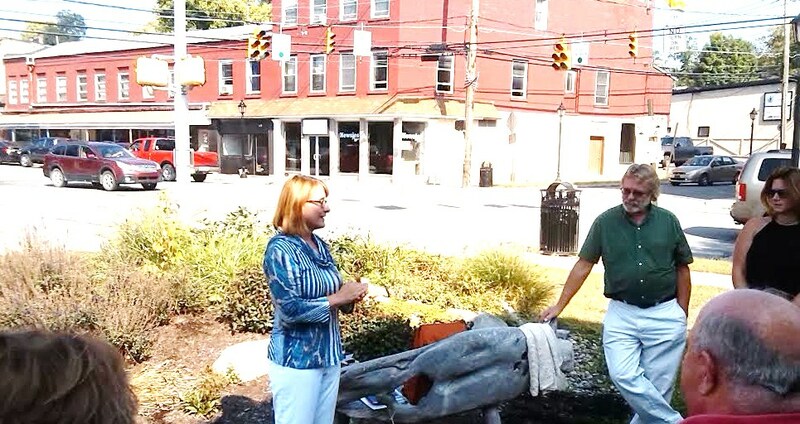 Endless Mountains Heritage Region executive director Annette Schultz (above, left) addresses the crowd gathered at the Dietrich Theater in downtown Tunkhannock, with EMHR greenways coordinator David Buck. Guests included (below, from left) Wyoming County Chamber of Commerce director Gina Severcool Suydam, DDH Design owner Diane Terrell, EMHR board members Marion Sweet and Sarah Carr, Endless Mountains Visitors Bureau director Jean Ruhf, EMHR board member Ed Zygmunt, County Commissioner Ron Williams, and Dietrich Theater director of cultural programs Margie Young. The Wyoming County Commissioners were on hand for the unveiling of the new Wyoming County Discover Northeastern Pennsylvania sign, which was recently installed at the intersections of Route 29 and Business Route 6 in Tunkhannock.